I like their chips and salsa bar. I really like that seasoned salt they have. I don't know why other (Mexican) restaurants don't carry that salt. There are always some fun "Stories" going on at Chuy's. 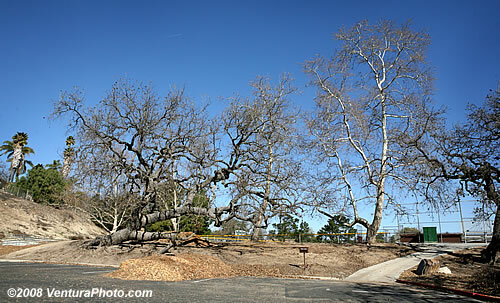 I had a quick photography sessioin at the beach in Point Mugu park. Finally, we had a lot of rain. 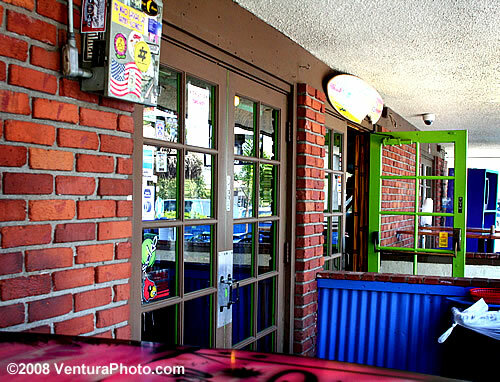 Old Town Camarillo was empty around 2pm during the weekday. I had an engagement photography session at Conejo Valley Botanic Garden. North side parking lot was very quiet. I shot a quick 360 degree shot. Carl Karcher, the founder of Carl's Jr passed away on January 11, 2008. I haven't gone to Carl's Jr for a year or so. Today, as soon as I heard the new on Carl's passing, I went to Carl's Jr for dinner. I thought I should pay proper respect. The man knew burgers. God bless Carl Karcher. 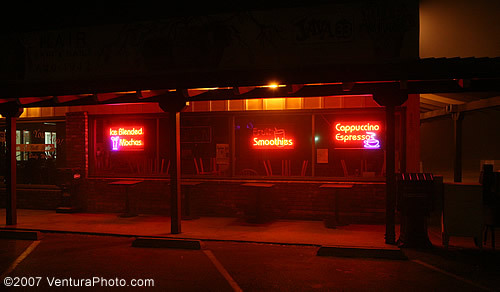 I have a lot of high school memories at Carl's Jr. Back then going to Carl's Jr was a big treat. I only went to Carl's Jr. during the weekend with my girlfrien as a big treat. 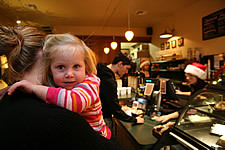 This photograph was taken April 1, 2006. 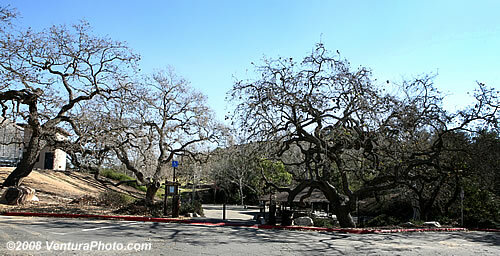 I often take snap shots like this as I drive around Ventura county. 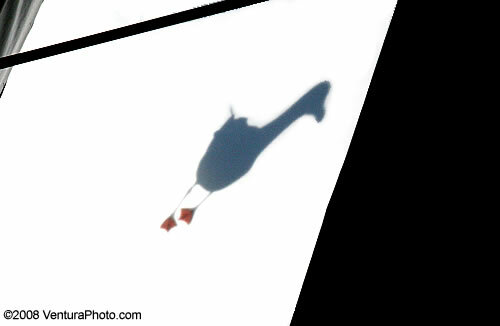 I don't normally trash boring images, because they may become valuable material later on. 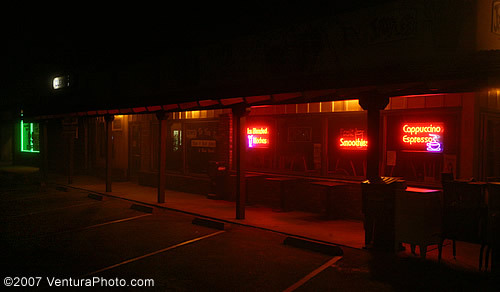 Below picture of old Oxnard strreet seems boring but there are interesting stories. 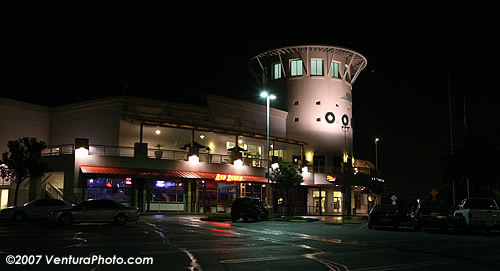 This intersection is located 101 freeway (North Bound) off ramp at Santa Clara/Rice Avenue. I get off freeway here to go to Costco & Fry's. 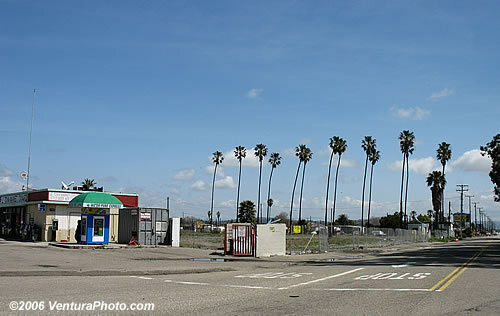 As of December 2007, this entire area is being cleared off so they can start building a brand new freeway interchange. Soon, this area will go through a major makeover that we will not remember how it was before. 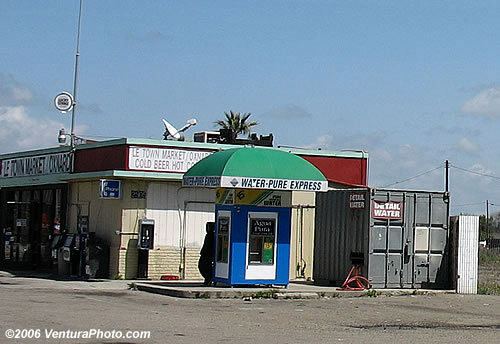 Le Town Market / Oxnard mini market is now demolished. The market was fenced off for several months. Then it was taken down. Next, about these palm trees. These are historic markers. These trees mark the spots where big houses were located. 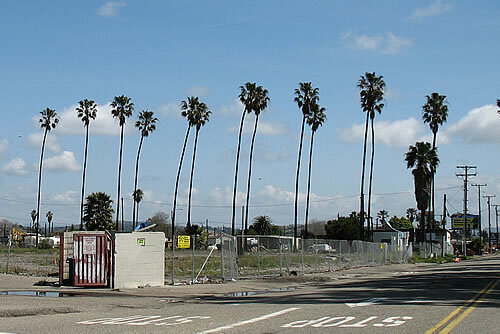 If you drive through farmland between Oxnard and Saticoy, you will see palm trees standing in this pattern. In fact there are number of places like this. These trees outline driveway to a big antique house. It doesn't show on below picture, but in most cases, there are big pine trees in front of those houses just like the one in front of the Camarillo Ranch House. I know for fact that there was an old house at the end of these palm trees. The house is not there anymore. 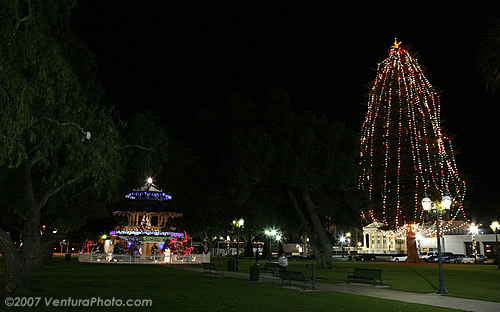 Ventura County's tallest Christmas Tree is located here in Oxnard Plaza Park. 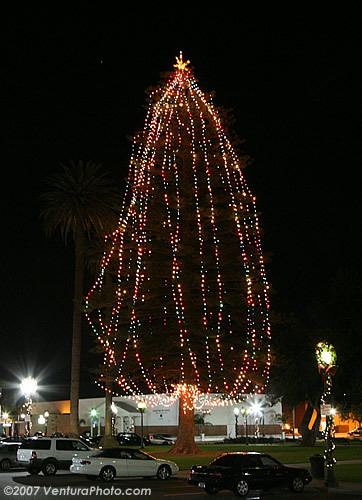 This is Fifty-Seventh year to light Christmas Tree at Oxnard Plaza Park. 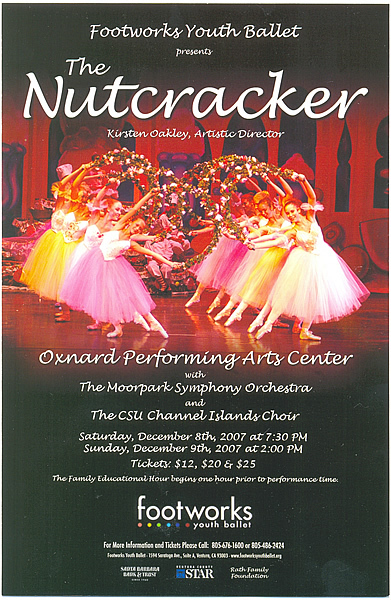 Back by popular demand, the City of Oxnard presents "Winter Fantasy Music & Light Show". 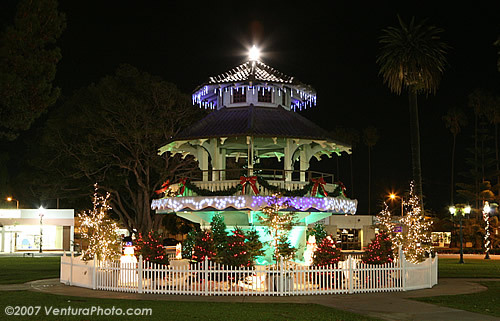 The Plaza Park Pagoda is decorated with beautiful lights and decoration. Every 15 minutes they display Christmas music and light show from the Pagoda. This is their second annual event. 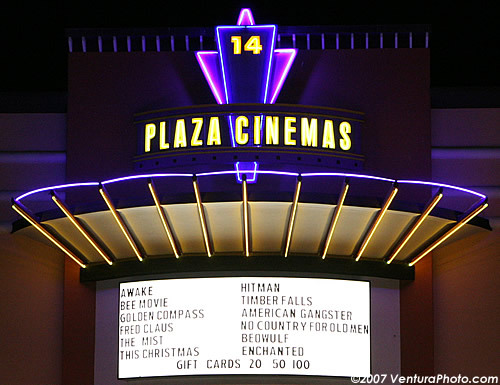 Besides the Plaza Park, City of Oxnard has more Christmas events you might want to check out. Sat. Dec 8, 15, 22; Sun. Dec. 9. 10am-2pm 7th & A st.
Dec 12 & 19. 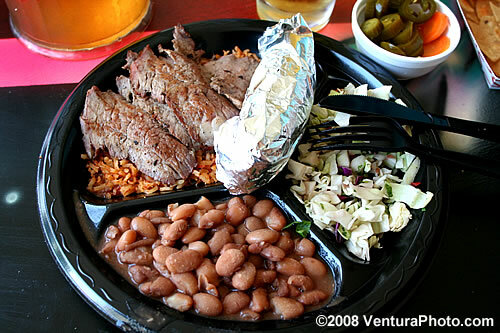 Departs from Centennial Plaza hourly starting at 6pm. 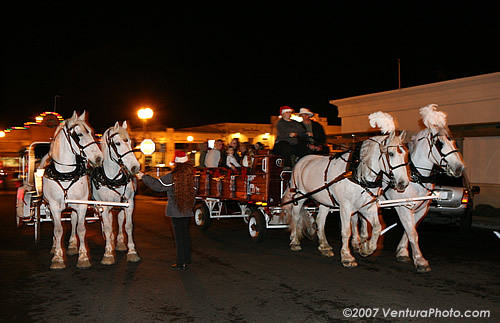 This 45 minutes tour includes a stop at Heritage Square plus a drive through Christmas Tree Lane and more. Cost $10 or unwrapped toy ($10 value). Proceeds go to Gull Wings Children's Museum and Toys for Tots. Call 385-2705 for reservation. 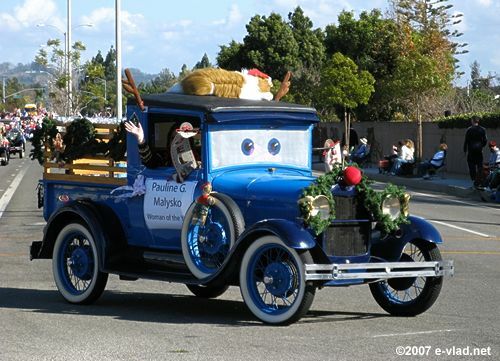 There is what appears to be an official Camarillo Christmas Parade website but that website is totally not updated. 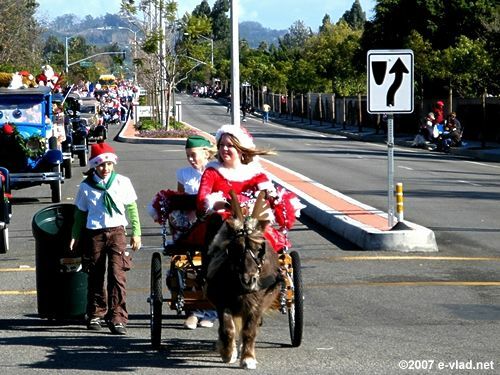 It's still accepting application for 2006 parade (www.camarillochristmasparade.com). 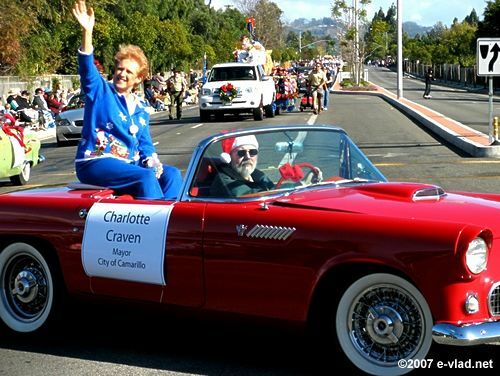 If you have any old and new pictures of Camarillo Christmas Parade please let me know. Below images are courtesy of www.e-vlad.net where you can find travel pictures & tips. Thank you very much. 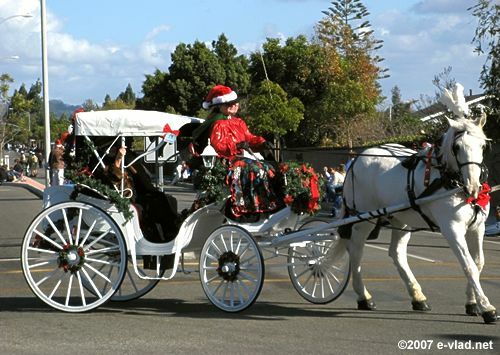 Old Town Camarillo kick started Christmas Season on the last day of November with carriage ride, appearance of Santa Claus, free hot Chocolate, tree lighting ceremony, and more. 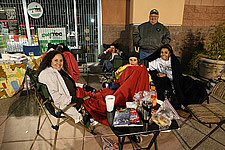 The event was organized by Camarillo Chamber of Commerce and Dynamite Booster club (dynamitesgymnastics.com). 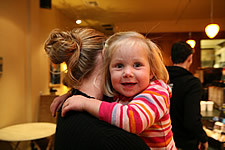 It was a heaven for the little ones and entertaining for the grown ups as well. Mr. Santa Claus himself was here. He took pictures with the kids at Camarillo Chamber of Commerce. Palermo Coffee provided free hot chocolate. 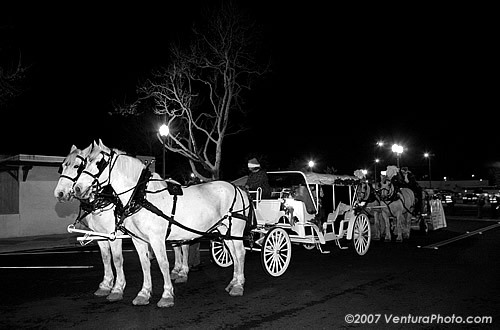 The carriages and horses in Old Town Camarillo looked amazing. These white horses were unusually big and they made a lot of clip clop sounds. Kids loved it. I was too cold and tired to stick around and document the whole event. I missed out on Santa Claus and tree lighting ceremony. 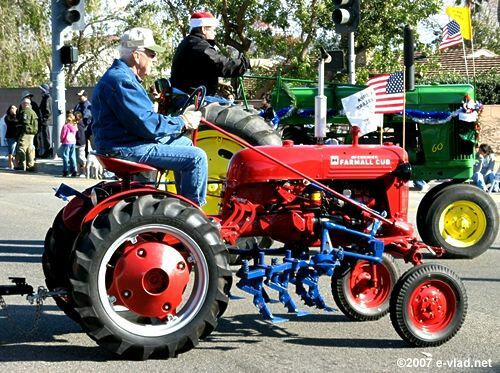 Santa has a lot more places to visit just in Camarillo alone; such as Fast Foto and Camarillo Community Center. Camarillo is a lucky city. 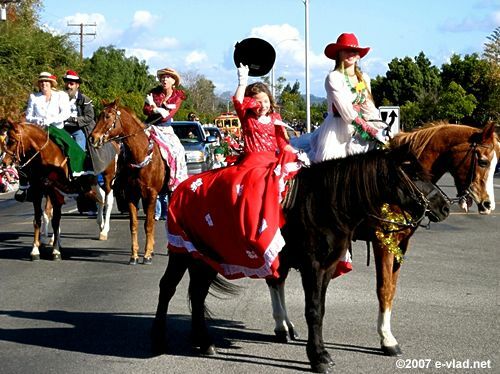 You can click below thumbnails to view the flier for today's Camarillo Holiday Celebration. 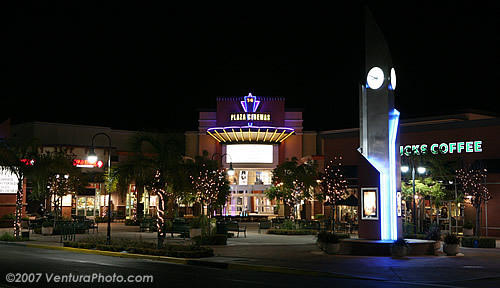 I arrived at Ventura Kohl's 3:50am. 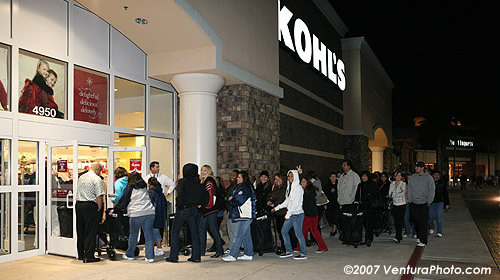 Kohl's was scheduled to open at 4am. 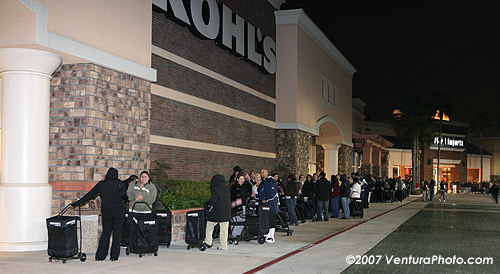 Kohl's was one of very few department stores in Ventura County opened so early. 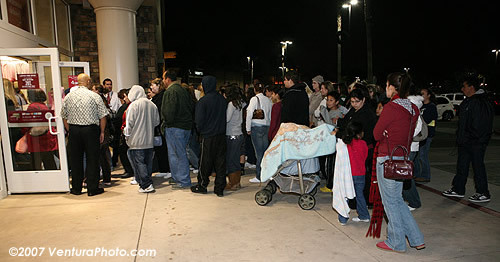 There was a long line reaching Barns and Noble. There were easily over a thousand people in the line. The line was long. 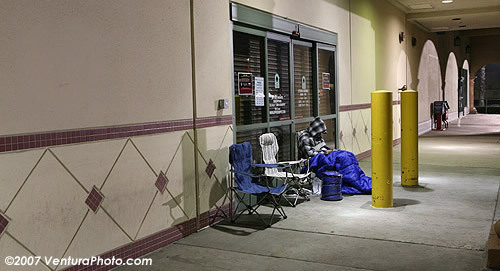 The first person in the line must have waited for hours. At 3:59AM I saw some people coming out from their cars and headed straight to the door (instead of going back of the line). One lady standing in the line shouted to them "The line starts back there. Don't think about cutting line!" The door opened on time and the line started to move. Two gentlemen from Kohl's held the door open for them and gave greetings. 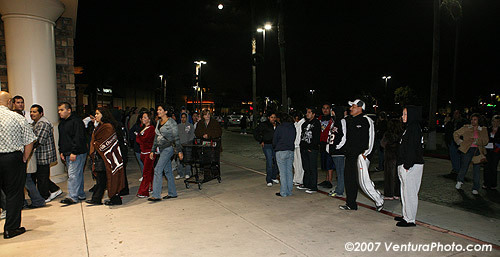 As soon as the line started to move more people came out from the cars and approached to the door. (below) One guy managed to blend in at 4:01am. At 4:02am there was a huge group of people trying to cut in line. It was a scary scene. They took little baby steps toward the door... Inch by Inch. A few people started to cut in line by this time. Below image was taken 4:05AM. It's a big mess. They were all pushing their way to the door. You cannot see from this picture, but there were hundreds of people still in the line, behind the view. It took about 7 minutes to have everyone in the line to get inside. All the line cutters made to the store before the last person in the line got in. It took about 7 minutes for everyone in the line to get in the department store. (In other words) The first person in the line has 7 minutes advantage compared to the last person in the line. 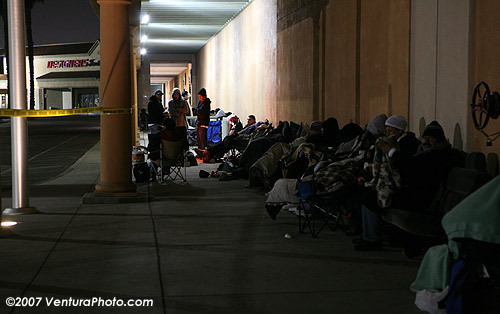 If you fail to locate your products fast enough, your 5 hours of waiting in the line will not mean anything. 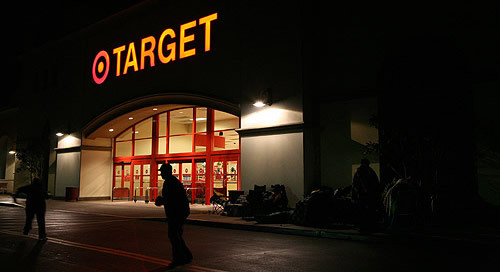 Most department stores do not have thousand shopping carts. So, if you are in the back of the line, you will not get a shopping cart. You better not planning to buy a lot of products. If you are in the back of the line, expect there will be a lot of people cutting in line before you. Those people never have to wait in line. They will think you guys are "Suckers". It's not fair, but that's how it is. But trust Karma. Those follow the rules are generally high class. Those break rules are generally poor people. Let them have their moment. As long as your goal is to enjoy the experience (and don't get too uptight about saving money) things will be fun. I had a lot of fun this morning. I spent many hours tonight, and I didn't buy anything. See you next year... Christmas here we come! 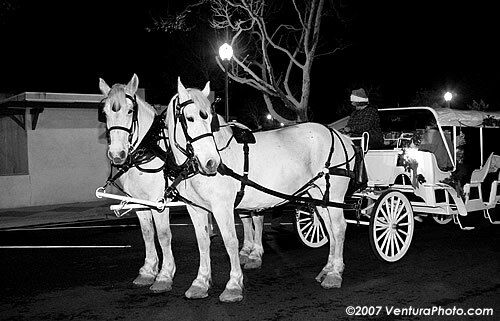 Photography by: VenturaPhoto.com Please do not copy anything from this page. Feel free to link to this page. 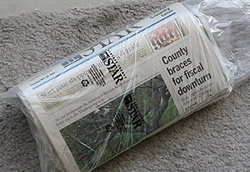 The Black Friday starts early Thanksgiving Day morning with a delivery of your newspaper. This paper contains a lot of fliers and coupons from local businesses. 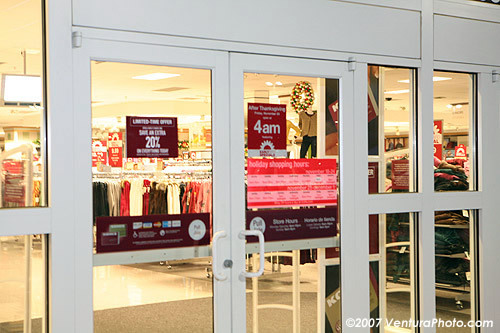 At 12:08am, Kohl's and Linens'n Things at Moorpark were totally empty. There was absolutely no car in the parking lot, and there was nobody in front of the door. I was a little disappointed to see virtually no action considering Kohl's would open in 4 hours. At Target, on the other side of the Market Place, there were about 10 people sitting in the line. Three people were playing football. I was out for less than one hour but I was already getting sleepy. It was also very cold. So we picked up some donuts and went back home for a retreat. We left home for the second time at 2am. 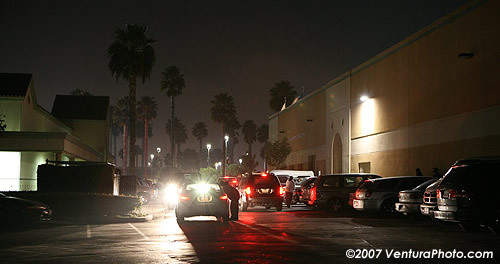 As we drove by Camarillo Factory Outlet on 101 fwy, we saw hundreds of cars trying to get into Factory Outlet. 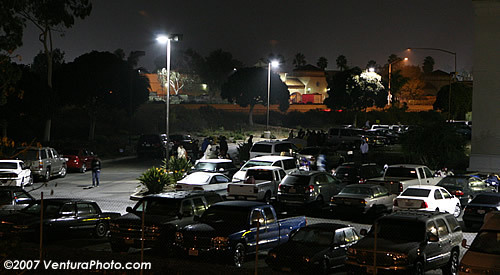 Traffic was so thick that entire Ventura Blvd around Camarillo Factory Outlet was a big parking space. Fry's at 2:15am was unreal. There were a lot of people waiting in line. 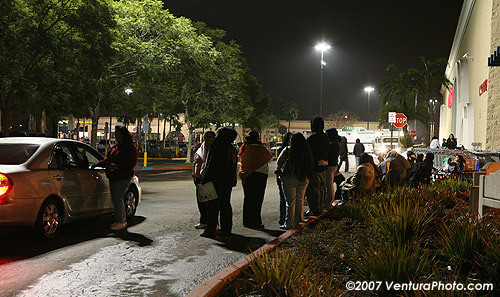 The line was reaching outside of the parking lot. Parking lot was busier than what you can see during the normal business hours. Compared to Fry's, Office Depot was pretty slow. There was only one person with three chairs. I guessed some family members were resting in the car. I crossed 101 Freeway to Best Buy at Shopping at Rose. I knew this would be the highlight of the Black Friday. Unlike any other stores, I saw a lot of tents at Best Buy, indicating that they have been there for many hours. 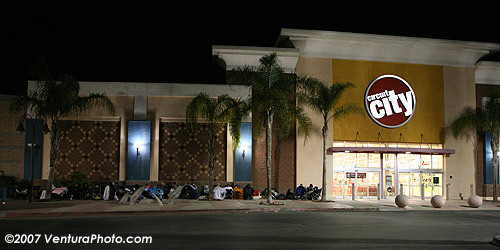 At 3am the line was in the backside of the store. Parking lot was full and there were people walking around everywhere. Best Buy had a courtesy to provide a porta-potty at the side of the building. Walmart (Oxnard) was interesting. They had a huge police vehicle parked in front of the building. Walmart at Oxnard has two entrances. They were two lines forming for each door. 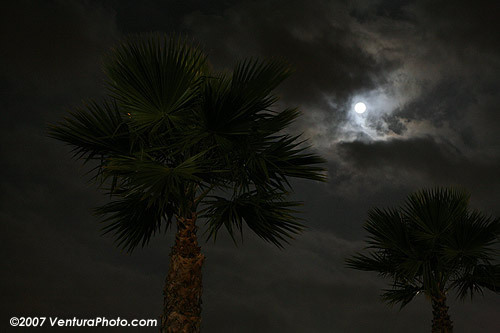 The night was cold and the Moon was bright. I met a lot of people. Everyone out there was happy. People didn't just come out to save money, but they came out to have fun. A lot of people waved at me and wanted to crack jokes with me. Some people wanted their pictures taken. A group of youngsters with loud music pulled up next to me and started to dance. 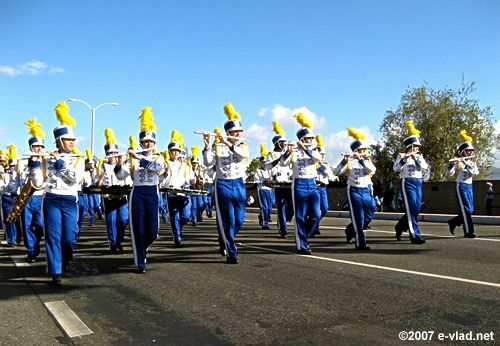 The entire Ventura County was in the party mood. Some people talk about Christmas being too commercialized that we forgot about the meaning of Christmas. As long as people can have fun and share love for the community I think it's all good. Look at these happy people. It's beautiful. God bless them all.